During her 40s, a woman will most likely experience irregular periods, which may come with heavy bleeding and cramping. This is because the body alters its production of estrogen and progesterone - the hormones that drive the menstrual cycle - during these years in preparation for periods stopping altogether. The result of this is infrequent periods, and bleeding that does occur may be heavy and come with painful cramps. Painful periods are uncomfortable and can impede your lifestyle if you do not address them. Read on for stress relief methods for painful periods. Exercise is a well-known antidote to menstrual cramps, but if you are suffering, you may not feel like hitting the gym or going for a jog. Yoga is a less rigorous form of exercise that focuses on increasing strength and flexibility, which allows you to participate at your own pace and push yourself according to your ability and comfort zone. Yoga uses deep breathing to tranquil music, which has not only been found to have a relaxing effect, but is also likely to center your mind and provide a distraction from your cramps. A warm bath is an effective way of soothing aching muscles in the lower abdomen and gives you an opportunity to relax uninterrupted, but you can maximize this effect by using aromatherapy oils in your bath. 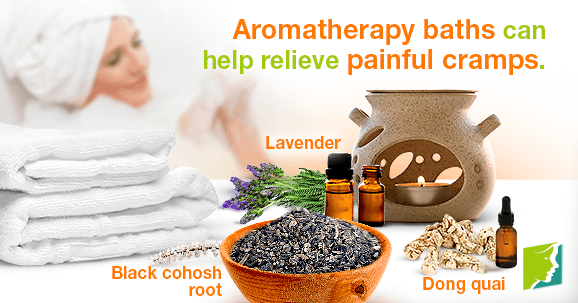 You could add a few drops of stress relieving lavender oil, which is an anti-inflammatory for pain relief, or black cohosh root, which is a potent anti-inflammatory often used in association with menstrual problems. Alternatively, dong quai has antispasmodic properties, which can help relax the muscles in the uterus to relieve painful cramps. A light massage around your lower abdomen can help relax the muscles there and relieve menstrual cramps; using aromatherapy oils can maximize the effect of this. Again, if you are suffering with menstrual cramps, walking or any other exercise may be the last thing you feel like doing. It may be tempting to stay in bed, but walking stimulates the release of mood-boosting chemicals called endorphins in the body, promoting relaxation to counter stress and pain brought on by heavy periods. You do not have to walk quickly or for that long to achieve this effect; a 15 minute stroll requires little exertion and will considerably reduce your cramping, or at least provide a distraction from it. PMR is a relatively little-known therapy which focuses on reducing muscle pain while promoting a relaxed state of mind. The process involves lying down and tensing individual muscles or muscle groups for five seconds before relaxing for 20 seconds and repeating. Founded in 1929 by Edmund Jacobson, the effect of PMR is one of a prolonged state of psychological and muscular relaxation. Setting aside 15 minutes a day to do this - even when you are not in pain - will help with permanently lowering your stress levels and preventing muscular cramping occurring in the first place. Although the irregularity of periods during perimenopause means that painful bleeding may only occur every few months, this does not detract from the importance of addressing the symptom. Menstrual cramps do not have to encroach upon your activities and commitments. Look for distractions from the pain, and combat cramping with activity and anti-inflammatory herbs to avoid compromising your lifestyle for the sake of a heavy period. The term “irregular period” does not have an exact definition. Because every woman's menstrual cycle is different, every woman's idea of irregular will also be different.Find how to overcome them here.